288p. bibliog. notes. Ballantine. Feb. 2019. Tr $27. ISBN 9780399180057. 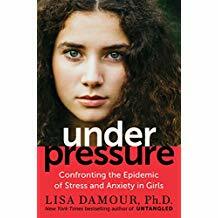 According to recent statistics cited in this latest book from CBS News contributor and psychologist Damour (Untangled: Guiding Teenage Girls Through the Seven Transitions into Adulthood), 31 percent of adolescent girls and young women struggle with symptoms of anxiety, experiencing edginess, fatigue, and changes in appetite, and are three times more likely than boys to be depressed. Damour testifies to similar conclusions drawn from her private practice and work at an all-girls school but states that these emotions can also stretch girls beyond their comfort zones in positive ways. The author addresses areas of strain such as interactions with family, school struggles, social pressures, relationships, and new tensions added by social media. For each of these facets, Damour offers suggestions for parents attempting to help their daughters manage the complexities of life at this age.